Day 88 – JR suddenly seems eager to learn and today he wanted to learn about what material do and don’t conduct electricity using his Grandad’s battery tester. Day 89 – I was testing out my new camera and lens and caught the concentration on JR’s face as he tried to write a letter by himself. Day 90 – There was much excitement from TP when he realised his magic beanstalk had started to grow. 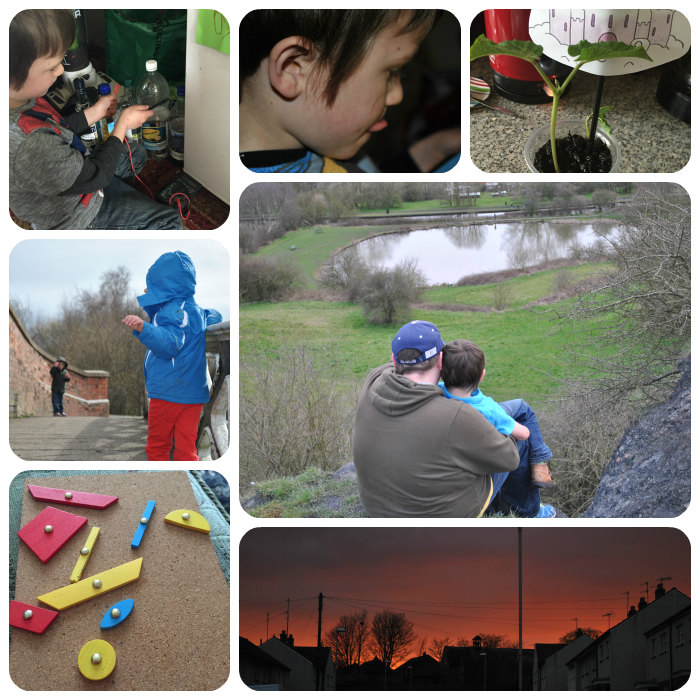 Day 91 – We took a walk around the local canal system. Day 92 – Another walk around the canals, this time with Daddy as well took us up to the top of a slack heap locally known as ‘The Pudding’ Daddy was pointing out all the local laces you can see to JR.
Day 93 – TP made a solar system using his tap-a-shape kit, You have to use your imagination but he is only 4. We should do more walking around the canals – I’ve got a disused railway line walk in mind too. JR seems to have a scientific mind. What a pretty sunset, stunning. And love the Daddy & Son Photo lovely moment captured. that is a great solar system, we loved tap a shape when my children were young. The concentration pictures with the tongues out always makes me smile. I hope the magic beanstalk does not have a giant at the top. Elaine, Tyler is convinced that there will be a giant at the top of the beanstalk. I just hope he’s not too disappointed. Love the photo on the bridge, the perspective is wonderful! The sunset is gorgeous too.